Recently, the public has been reminded that Modern exists. This has naturally reignited discussion about bannings. GP Pittsburgh featured a lot of fair, powerful decks battling for fame and glory. This was generally fun, exciting, and interesting. GP Pittsburgh also featured Amulet Bloom. This was controversial, upsetting, and bordering on taboo. Parents were covering their children’s eyes, commentators were sweating in their boots, and Twitch chat was spamming panicBasket. Major news networks were blasting opinions and misinformation under false labels of “fact”, and gas prices nearly tripled. Today, I plan on saving the world. Let’s get some things straight. Let’s talk about the bannings. In March of 2005, two things were happening: I was about to embark on the great voyage known as High School, and Affinity was dominating Standard. Arcbound Ravager, Disciple of the Vault, and the artifact lands were stealing lollipops from children left and right, and Wizards knew something had to be done. Kamigawa Block was a step down from Mirrodin power-wise, as Wizards realized power creep was getting dangerously high, but this did nothing to stem the metallic tide. After the rotation of Onslaught block, Affinity’s future was secure, and Wizards pulled the trigger, obliterating the archetype in one fell swoop. Some have said that it’s as if millions of voices suddenly cried out in terror, and were suddenly silenced. While bannings were not uncommon before Affinity, the events of early 2005 brought with them some valuable lessons. Players now had a clear example of a completely “broken” metagame and many quit the game for good. Wizards was hit where it hurts the most (their wallets), and made sure to take drastic steps to prevent future sets from causing the same issues. The dangers were now known, the variables clear. The lesson had been learned. Well, apparently not. In this section I will be quoting heavily from Aaron Forsythe’s B&R announcement from June 20, 2011 (also known as Judgement Day). Maybe I’m just a nostalgic historian, but I find these quotes EXTREMELY interesting. A lot of times, we look at an archetype, or individual card, and call it “broken” without giving any thought to context or further definition. Define “broken”! … I’ll wait. Not so easy, right? To be “oppressive” or “ban-worthy”, we absolutely have to evaluate context. 32 copies of Goblin Guide in the Top 8 of a Pro Tour or Grand Prix means absolutely nothing if everyone plays Kor Firewalker the next week. But hold on, because right there lines are already getting blurred (right Robin Thicke?). If Goblin Guide IS so powerful that everyone has to play Kor Firewalker just to stand a chance, then a case can be made for Guide being “oppressive” and ban discussion can be had. Likewise, if a combo deck is so powerful that the only way to disrupt it is through Thoughtseize, then a case can be made for that deck to be oppressive, as it places unhealthy pressure on other decks in the format to play Thoughtseize just to compete. We’ll talk about Amulet Bloom specifically at the end of the article, but first I wanted to give a little history of bannings in Modern, using Wizards’ own words to provide context to these events. This could easily get out of control (meaning word count) as every B&R announcement has months of tournament results, back and forth metagame shifts, and deck specific details to discuss, but we’ll just hit the main points here. If this disappoints you, let me know and I’ll start my novel. I highly suggest reading both articles, as Tom LaPille gives a card by card breakdown of why each card is banned, which is highly illuminating and can give us insight into Wizards view on what makes a card or archetype “ban-worthy” or not. We can LITERALLY anticipate Wizards’ position on format health by reviewing the decisions they have made in the past. It’s almost as if there’s evidence, and all we have to do is look at it…! Pro Tour Philadelphia basically featured a “best of the rest” combo field filled with all the broken cards that Wizards missed on their first pass. Infect with Blazing Shoal and 12Post were the worst offenders, but Wizards also showed they were interested in cultivating diversity by banning the best blue cantrips and green tutoring (as every blue deck “had” to play Ponder/Preordain and every green deck “had” to play Green Sun’s Zenith). The language in this announcement is very important. Erik Lauer is careful to point out that they are committed to restricting “top-tier” decks from winning on Turn 3 (or earlier) “consistently”. I believe this decision was made for two reasons. First, they don’t want to discourage newer players from acquiring a “hot new deck” that is popping up in Modern. Making potential customers feel wary of a looming banning makes them wary of reaching into their pockets, which is something every company wants to avoid. Second, they establish a benchmark for players to (hopefully) pay attention to when new decks do break out. Were a hot new deck like, say, Grishoalbrand or Lantern Control to arise, Wizards would know citizens wouldn’t cry for immediate bannings, as it takes more than one high-profile event to make a deck “top tier”. See what I’m getting at here? Amulet Bloom taking second at one Pro Tour doesn’t by itself warrant a banning, or even ban discussion. More data is needed. Here we see two bannings based entirely on promoting diversity. Punishing Fire literally punished all creatures with less than three toughness, which made Wild Nacatl the universal option for decks looking to attack. 2012 was relatively quiet, though a case could be made for nerfing Jund earlier. The exact events are listed in the article, but a Pro Tour and four consecutive Grand Prix passed where Jund was over-represented and winning in the finals of each. Valakut, the Molten Pinnacle was unbanned in October, but other than that, 2012 was all Jund, all the time. So here we see again Wizards’ commitment to cultivating a Modern format that is diverse, while also restricting Turn 3 kills. Again, the language here is important, as Wizards realizes it’s unfeasible (and pretty heavy-handed) to nerf every deck that is capable of winning on Turn 3, but there is a measurable point of both representation and consistency at which discussion can begin. Aside: Without getting too philosophical, in this digital age of Facebook and Twitter where individuals can throw their opinions out to mass audiences as much as they’d like, we’d like to believe that our individual opinions are seen as important and interesting to others. Wizards of the Coast cares much more about issues at their events and what their Tournament Organizers have to say about event times than what 3,000 people in Twitch chat might group-think. That’s not to say that they don’t care about public perception, which is in fact most important, just that one Twitch chat mega-discussion on the weekend isn’t enough to sway Wizards’ minds like we think it is. I’m surprised at the language in the B&R announcement. Prior to re-reading this I was under the impression that Deathrite Shaman was banned for other reasons. Erik states that Deathrite Shaman made it too easy for attrition strategies (read: Jund in the BGR and BGRW forms) to disrupt synergy based decks. This is entirely true, but Deathrite Shaman also had other significant effects on the format. First, it allowed “fair” decks a way to consistently fight graveyard-based strategies. Decks without card filtering/tutoring (read: non-blue decks) often have difficulty finding sideboard cards quickly in post-board games, and Deathrite Shaman effectively allowed attrition decks 4+ ways to interact with decks that use the graveyard, starting on Turn 1. In conjunction with numerous discard spells, Jund was able to reliably and easily disrupt synergy-based decks. Second, Deathrite Shaman was far and away the best mana accelerator available, which restricted diversity and forced basically every deck in those colors to include it. With this in mind, I’m wary of projecting my own opinions onto Wizards’ decisions, as we’ve been careful not to do that up to this point. My reasoning is in line with their past decisions, but I’m cognizant of the risk of taking away “evidence” of Wizards’ position when they haven’t explicitly stated so. Perhaps they didn’t feel Deathrite Shaman was detrimental to format diversity? Reading their announcement carefully definitely suggests that their main focus was reducing the power of attrition decks, Deathrite Shaman’s individual power level, and promoting synergy-based format innovation. These bans were relatively straightforward; Birthing Pod had been pushing out the other creature decks in the format and winning nearly every GP, and Treasure Cruise/Dig Through Time proved that delve truly is busted and made the blue decks way too powerful. Golgari Grave-Troll’s unbanning came with some language that reinforces the idea that Wizards is interested in diversity, as long as it doesn’t lead to oppression. So, should Amulet Bloom be banned? I can only give my opinion, and I hope I’ve given you the tools to formulate your own. Amulet Bloom definitely classifies as “non-interactive”, but I think we’ve clearly proven that this isn’t an attribute Wizards considers when evaluating bans in Modern. When Amulet Bloom wins, it doesn’t take too long to go through the motions. It takes some time to search and navigate the triggers of Primeval Titan and Amulet of Vigor, but no more so than other decks like Storm or Ad Nauseum. It is capable of Turn 3 wins, and can win on Turn 2 a surprising number of times, which throws up a strong red flag. I don’t have data on consistency of kill, and those numbers have to be taken with a grain of salt as they can vary week to week and event to event based on individual deck composition and opposing hate. So far, we haven’t seen Amulet Bloom take down a major event. It came close in the hands of Justin Cohen, falling to Splinter Twin in the finals of Pro Tour Fate Reforged, but the deck can hardly be classified as “Tier 1” on that single finish alone. Based on metagame information its representation is getting there, but I disagree about this status. Whether it’s consistency, difficulty to pilot, or some other factor, the deck has not been prevalent at the top tables, which makes any argument for banning it pretty thin. When Amulet wins, it wins decisively, and it can feel pretty “unfair” when the Amulet player is chaining Tolaria West for Summoner’s Pact and casting Primeval Titan with a Cavern of Souls AND Pact of Negation backup, but none of that is particularly unfair. Yes, Turn 2 kills are unfair. However, given Wizards’ past positions until Amulet starts winning events consistently, or killing on Turn 2 with regularity, I don’t expect we’ll see a banning. And I don’t think it deserves one either. This coming from a player that despises losing to Amulet Bloom. Thanks for reading! I’d love to hear your opinions/feedback! Let me know in the comments or on Twitter, and I’ll see you next week! Great Read, I really dislike playing against the deck as well (amulet), but as you mentioned it hasn’t put up the primetime results. The deck is still on the scale of degenerate that i disapprove of though. 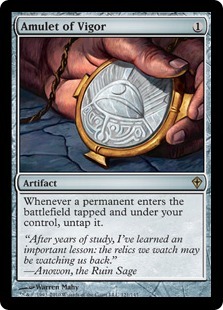 If you were to ban a card from amulet what card would it be? I honestly think the reason it hasn’t been widely adopted sooner is because lot of people don’t want to invest time in learning and playing a deck they believe is strongly at risk of being banned. We’re at a point now where I think a lot of people are feeling comfortable that maybe it won’t be banned after all, and it’s starting to see enough meta game share where we’ll see results. I personally think the deck is very strong being able to win on turn 2-3 AND having inevitability to just win on turn 6 or 7 through disruption is enough for me to think we’ll be seeing a lot more results from the deck this upcoming modern season. I personally *believe* that this time next year it will have out up results consistently enough to force a response from wizards. I think Rich is right- the conversation would be different if Bloom were a relatively straightforward deck to play. The (perceived) skill required to pilot Bloom leads to a Prisoners’ Dilemma-type situation in which it’s only worth taking the time to learn to pilot if nobody else does the same. Feels like the fear of bannings is affecting its meta share, making the argument that it isn’t dominating the metagame largely self-fulfilling. I totally agree. And somewhat think that the same thing has happened to Instant Reanimator. Amulet and Reanimator are both format breaking decks. And maybe the real reason why they havnt been putting up the results is because a large portion of players are afraid of bannings, and don’t want to waste cash on an expensive deck.. I think Summer Bloom should be banned. My reasoning is because Amulet of Vigor is a combo piece that has no board presence on its own, whereas Summer Bloom’s only weakness is the lategame. Another reason I think Amulet Bloom should get a nerf is because it’s big weakness is another card that removes diversity from the format: Blood Moon. I think Blood Moon should be considered for a banning, because it stresses land bases too much and makes Fetchlands mandatory. Ban Bloodmoon and you will see MORE greedy, greedy manabases. I’m always surprised when players claim that Blood Moon makes you play more fetchlands. From my experience the fetch/shock manabase is the problem with rather than a solution to Moon. Playing fewer fetches and colors for more basics is an easy way to beat the Moon and also make you less vulnerable to burn. Most 3 color decks run 10+ fetches and 6-8 shocklands while two color decks can cut down to 4-6 fetches and 4 shocks and play more basics and utility lands in the open slots. What you lose in power you make up for in resiliency and consistency. The problem with removing Blood Moon is that it, or at least the fear of it, keep the 5-color Good Stuff decks down. Say what you will about Moon, a world where the default, and probably correct, decision is just to play all the good cards and Splinter Twin in the same deck seems bad. Blood Moon forces decks to stay honest or just lose, improving the format by what it removes, rather than what it adds. I’d be interested in what this 5 colour deck would look like. Burn, not blood moon, is what is holding too greedy mana down. Grixis twin is not completely destroying straight ur thanks to its inferrior burn matchup, not its vulnerability to moon. And its the same with many other 3+ c strategies. By far your mtg ban articles are the best on the internet. Most of the other ban articles from other players are – most of the time – just personal thoughts/cry. Some players don’t understand how wizards thinks about ban list and just call ban every time they loose to an specific deck or card. I won’t say that some cards don’t deserve to be banned but I think they only should be if they make the format unhealthy. I think that less bans are better than lot of bans because they bring more diversity for the format. I think that Titan Bloom deck is cool but instead of banning amulet I think that banning summer bloom would be a better choice because it just don’t kill the whole deck. You can amulet than azusa but since azusa is a creature you have more answers against her (lightning bolt). But one point I would like to say is that people should just stop to cry for ban every time a new combo/deck emerges, unless they are unfair like consistent turn 2-3. People should stop crying and starting to learn how to build and play with sideboards. Most of the players (even the pros) know how to write a “ban everything” article but they just don’t know how to build and play wise sideboards. They want to play a “unbeatable” deck that can win against everything at game one without sideboard anything and when they loose to a combo or something like that they just cry for ban. Griselshoal is a glass cannon deck (strong one) but you can just play a surgical extraction turn 0 and remove their griselbrands. They can alternative win turn 4-5 with Through the Breach but isn’t turn 4-5 the same turns that splinter twin are beating you with infinite stuff? They have to have griselbrand in the graveyard for surgical extraction to hit it. This isn’t cranial extraction. You can hit it while goryo”s vengeance is in the stack, no? Great read. I get tired of people crying about combo decks that break the turn 4 rule. But burn and Affinity can generate turn 3 kills with burn having the most consistent turn 3 kill. Infect has been strong and can get turn 2 kills, but kills fairly consistently on turn 3. The problem with all these and the other “busted” combo decks, is that these kills exists in a realm of no interaction. Yes these decks can sometimes just have the nuts and get free wins, but so does affinity, burn, and infect. If we are going to start banning everything that potentially breaks the turn 4 we are going to have a ban list so long it’s not even manageable. – Pretty awesome article. The main selling point of this website for me is how some of the articles have a very solid factual ground behind the reasonings. – A “minor” remark: Amulet is very peculiar in a sense. When people think turn X kill, they usually think actual 0 life or 0 cards in library. The thing with bloom is that there are many scenarios that are not quite as absolute, output nearly the same result. Let’s take the following example: Turn 2 Primeval Titan without amulet, search for Tolaria West + Bounceland. Now, nothing is going on in terms of life totals or anything like that, but ask yourself, how many decks can actually beat that? It’s not 100% sure the bloom player is going to win, but how further less than 100 do we need to go to consider it a virtual win? I’m not advocating bloom should be banned because I quite frankly don’t know, but where previously I was on the side of “obviously shouldn’t be banned because it’s not t2/3 consistent enough”, now I see things a little differently and I wouldn’t be suprised either way, regarding the bannings. How do you get a Turn 2 Titan w/o amulet? The only way to do it is with multiple spirit guides, and no one does this. I think you meant turn 3 Titan w/o amulet. You ramp to five on turn 2 and lay down the 6th mana on 3 for the Titan. And starting chaining one Primetime a turn. And in that case, I say: the problem is not Amulet the Bloom, is the other decks that are also too linear and forfeit removal to stand a better threat early or that are so passive that cant remove and deal without threats without applying pressure. Personally, the case of Amulet Bloom reminds me a lot of Storm right before Seething Song was banned. It didn’t win many major events, though it came close, but what the deck was capable of in practice and on paper went against WOTC’s goals for the format as a whole. Seems logical to me that if they do decide to take action against A-Bloom it would probably be in a way which would outright stop it from killing on turn 2. Summer Bloom would be the most likely card to be axed from that deck since it is by far the most important card when we are discussing turn 2 kills, they are simply impossible without it. The deck would still work, I guess, but it wouldn’t be nowhere near as fast and it could actually be hurt by a wider range of disruption cards besides Blood Moon. Finally, a question for the readers who oppose bans against A-Bloom: If no bans should be made to slow down that deck why is Seething Song still banned? Seething Song is banned because Storm was a Tier 1 deck. The fear of banning will forever doom Amulet Bloom from being a Tier 1 deck. The problem with Amulet Bloom (and Grishoalbrand), is that you can enter the round with a game plan and just straight lose two games in a row with no realistic chance of interacting and winning because they got their nut draws and that could mean the end of your day 2/money/top 8/winning prospects. I know other decks also have nut draws but they’re less consistent and more vulnerable to interaction. I agree with the sentiment though – free Seething Song, or ban Summer Bloom. It doesn’t seem right to have them on opposite ends. Seething Song banned and amulet cards not, very nice! Guys, the reason why Seething Song got banned (same with nerfs for Jund, Pod ban and co) was the huge metagame share. Storm had a metagame share from more than 14%, but it didn’t had high end wins (“just” some top 8 and 16). Combined with the rather consistent turn 3 win led to a banning of Seething Song. So GP reward for 2016, will be Stoneforge Mystic (SFM). Does anyone think, that SFM might see an unbanning in Modern? No. It’s a very fair card. Doesn’t lead to busted combos. But the power level is considered too high. I think given time a lot of cards will slowly come off the ban list as the power of the format creeps higher and they realize that they can’t maintain the format through a bloated ban list. Maybe if they exchange it with Batterskull, but I really doubt it. Aaron Forsythe has said several times that he badly underestimated SFM with Batterskull and Wizards prefers to ban enablers rather than “fair” cards. It’s fine in Legacy thanks to Wasteland, Daze and Force of Will but in Modern? Bolt is probably not enough to keep Stoneblade from taking over. Probably not because Mark Rosewater answered a question why Stoneforge was banned in modern. ” @maro254 if you could change the design of Stoneforge Mystic to mean she wasn’t banned, what would you change? I see what Rosewater is saying in that she tutors and cheats big equipment into play like Batterskull. With the Prevalence of Kolaghan’s command due to Grixis Twin, and Jund you figure that be enough policing to at least make people hesistant to overcommit to the stoneforge. Instead of Karn or Amulet that only fits into their own decks, Stoneforge Mystic can be splashed into a lot of decks. Batterskull doesn’t need haste because it will enter the field during opponent’s end phase. Cheating a turn 3 Batterskull so easily (with mana open to counter) and something that fits into any deck will just make the format unhealthy. It has the same issues as Birthing Pod: Tutors that also allow to bypass mana costs are extremely overpowered. Don’t see the point of unbanning it and having to ban it later. “But K-Command kills it and the t3 Batterskull”. Well, besides the fact that a lot of decks don’t play K-Command, we don’t know what future equipment will be printed. As a fan of Modern in general, content like this is what makes this site unique and awesome. Keep up the great work, guys! I have always felt that the only card that should even be considered for banning in Amulet Bloom is Hive Mind. You remove the turn two boogeyman that causes interactions WoTC never intended and the format as a whole isn’t equipped to address, and you still have a brilliant, versatile combo deck that can still apply pressure early and steadily. That said, we don’t see the field dominance that would necessitate this banning yet and there are a number of decks in circulation that keep it in check. Part of me still thinks, should a ban be made in January, Hive Mind would be one of the smarter ones if not for format health, for perceived format health. Still, we’re looking at a much healthier modern than we ever have been. We’re at a point where the focus needs to be on possible deregulation, not regulation. Finally someone that thinks reasonably about this deck! I agree that Amulet Bloom does not deserve a ban (by now) but if more linear decks appear it will be tier one because there will be a lack of disruption, the same for PiF. Also, you forgot that Amulet Bloom can win in turn one, and is the only deck that right now is capable of that. Grishoalbrand would like to have a word with you. We normally see Sheridan write articles like this and it’s no surprise that it reaches the same conclusions. The decks I enjoy playing (Jund and Tron) have terrible matchups against Amulet. I’d personally like nothing more than to never see it at another tournament. I paid a lotof money to play these decks only to lose to some scrub that isn’t nearly as skilled as me. Magic is a test of skill, right? How is this in anyway fair? —– I’d probably say something like this if I was a troll, but they’re very real thoughts and negative feelings in the post-game salt. It’s no surprise this carries over. Currently, I see decks like Amulet, Grishoalbrand, etc enter into tournaments in hopes of winning “rock, paper, scissors” all day. A more pragmatic way of describing this is with a “safety valve” metaphor. Jund was getting very popular June, so Tron came in and won a couple tournaments. Twin’s numbers were falling, so affinity creeped in. If Tron is over-represented then Infect, Scapeshift, Amulet, and Grishoalbrand will be out in force. Is everyone playing Twin? Time to sleeve up Burn and Jund! The format is too wide for one deck to cover all the bases (read: there’s almost always a safety valve), so meta calls become a very real and very threatening thing. Maybe “too wide” is a bit ambitious. Amulet and Grishoalbrand struggle against decks with efficient countermagic. The same can be said for a lot of decks, which has given rise to Grixis Control. Twin decks pack efficient countermagic, Blood Moon, and an “oops, I win” combo, giving it a LOT of game against a huge portion of the field. Now, combine this with the fear of buying into Amulet and Grishoalbrand that others have mentioned. What we have now are metagames where busted combo decks are unrepresented and the “safety valves” are over-represented. Why not? Most would consider these decks safe. That is, until they’re represented so highly that they get banned for “stifling” the metagame. tl;dr: I think it’s more likely that a deck like Twin gets nerfed before Amulet since it’s considered a “safe” choice against linear combo decks, which may lead to its over-representation in the metagame. This has been my conspiracy theory of the day! So happy to finally see a non-emotional rational analysis of the reasons for (not)banning amuletbloom. Too many times I’ve read articles about banning cards just because people hate losing to it, and just can’t adapt to a changing meta. I know it can be frustrating to be winning game and losing in one turn to a combo (i.e. Grishoalbrand), but that’s part of the diversiteit if modern and no reason for bannings (I also hate bring in a soft lock of permissies spells the entiteiten game).. Loved the analysis through the years. Great read, keep up the good work! Sorry about the autocorrect: diversiteit=diversity, bring=losing, permissies=permission, entiteiten=entire. Amulet is the most powerful deck in Modern, it’s not close. If you are not seeing it played in any meta it is because it is boring to play (shuffle shuffle shuffle), some part of it is probably going to get banned, and the biggest thing is that people are Sandbagging it in the hopes that it won’t get banned due to low representation. If bloom makes it to the PT unbanned and into Modern Season, you will see the price off all those cards go crazy and the deck will push 12-13% of the meta if not worst. The only solid defense against it is Blood moon, which ironically, is on a lot of short lists for bans itself. Personally, I would be happy if they just banned hive mind and then we can see where it is at. You can plan a defense against 4 titans, but having to defend against 2-3 titans in the first 5 turns, establish a clock, and then if you do manage that… you still have to win the game before hive mind shows up and you insta-lose. It’s too much, either it has to be slowed down, ban amulet or bloom, or take the alt win con in hive mind.